who saw these probabilities—either by themselves or with the nomination probabilities—changed their minds. Among those who saw only those probabilities, Romney led Gingrich, 36% to 29%….Romney benefited most when respondents were cued to think about electability in November 2012 and who is most likely to defeat Obama. 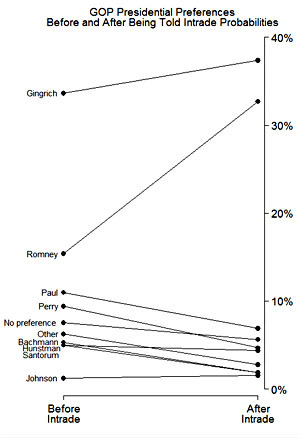 This is especially impressive since InTrade gives Romney only a modest general election advantage over Gingrich. But that was enough. Apparently, just getting people to think about electability is enough to produce a huge swing from Gingrich to Romney. The sample size on this poll is fairly small, so don’t take the specific numbers super seriously. Still, the swing from Gingrich to Romney is big enough that it’s almost certainly for real. If Romney wants to win, his best bet is to pound daily on the idea that nominating Gingrich will just give Obama an easy ride to a second term.